by Chris Woodford. Last updated: October 6, 2018. You can survive without food for several weeks, because your body will gradually switch to using stored fat and protein to make its energy. But cut off your water supply and you'll be dead within days. Water equals life: it's as simple as that. Around two thirds of your body (as much as 75 percent if you're a baby) is H2O. Even your bones, which you might think are completely solid, contain about 25 percent water. On average, we need 2.4 liters (0.6 gals) of water each day to keep ourselves healthy (though we don't have to drink anything like that much—we get a lot of our water from inside foods). With water so important to our lives, it's hardly surprising we like it clean, pure, and tasty. That's one reason people spend so much money on water filters that can remove any harmful impurities. How do they work—and do we really need them? Let's take a closer look! 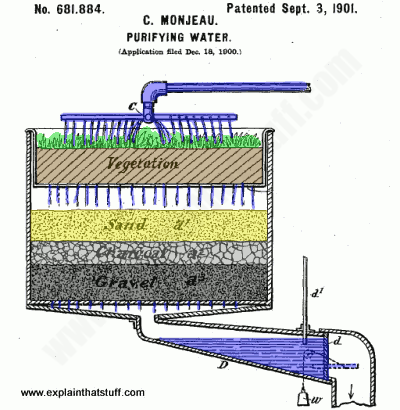 Photo: Living filter: A classic wastewater filtering system outlined in a 1901 patent by Cleophas Monjeau of Middletown, Ohio. Dirty water drips down from the tank at the top (blue), passes through vegetation (probably a reed bed), which removes nutrients, organic matter, some kinds of pollution, and some bacteria, before dripping down through sand, charcoal, and gravel filters. The cleaner water is collected for reuse in another tank at the bottom. Reed beds are still widely used in purifying wastewater to this day, including in systems for cleaning up runoff from highways. Artwork from US Patent 681,884: Purifying water by Cleophas Monjeau, issued September 3, 1901, courtesy of US Patent and Trademark Office. Thanks largely to an unusual molecular structure, water is amazingly good at dissolving things. (We look at this in more detailed in our main article on water.) Sometimes that's helpful: if you want to bust the dust from your jeans, simply throw them in your washing machine with some detergent and the water and soap will pull the muck away like a magnet. But there's clearly a downside to this too. All of our water constantly circulates through the environment in what's known as the water cycle. One minute it's rushing through a river or drifting high in a cloud, the next it's streaming from your faucet (tap), sitting in a glass on your table, or flushing down your toilet. How do you know the water you're about to drink—with its brilliant ability to attract and dissolve dirt—hasn't picked up all kinds of nasties on its journey through Earth and atmosphere? If you want to be sure, you can run it through a water filter. 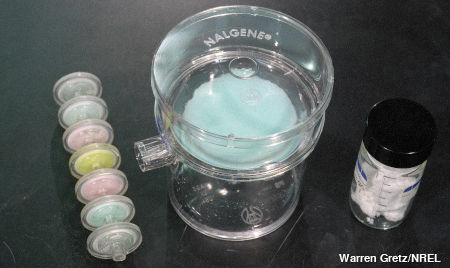 Water filters use two different techniques to remove dirt. Physical filtration means straining water to remove larger impurities. In other words, a physical filter is a glorified sieve—maybe a piece of thin gauze or a very fine textile membrane. (If you have an electric kettle, you probably have a filter like this built into the spout to remove particles of limescale.) Another method of filtering, chemical filtration, involves passing water through an active material that removes impurities chemically as they pass through. Photo: Physical filtration: A NanoCeram Nanoalumina filter is a physical filter made from an alumina-based ceramic. It has nanoscale fibers— small enough to remove 99.99999 percent of viruses and bacteria from polluted water or air. Photo by Warren Gretz courtesy of US Department of Energy/National Renewable Energy Laboratory (DOE/NREL). There are four main types of filtration and they employ a mixture of physical and chemical techniques. The most common household water filters use what are known as activated carbon granules (sometimes called active carbon or AC) based on charcoal (a very porous form of carbon, made by burning something like wood in a reduced supply of oxygen). Charcoal is like a cross between the graphite "lead" in a pencil and a sponge. It has a huge internal surface area, packed with nooks and crannies, that attract and trap chemical impurities through a process called adsorption (where liquids or gases become trapped by solids or liquids). But while charcoal is great for removing many common impurities (including chlorine-based chemicals introduced during waste-water purification, some pesticides, and industrial solvents), it can't cope with "hardness" (limescale), heavy metals (unless a special type of activated carbon filter is used), sodium, nitrates, fluorine, or microbes. The main disadvantage of activated carbon is that the filters eventually clog up with impurities and have to be replaced. That means there's an ongoing (and sometimes considerable) cost. Reverse osmosis means forcing contaminated water through a membrane (effectively, a very fine filter) at pressure, so the water passes through but the contaminants remain behind. If you've studied biology, you've probably heard of osmosis. When you have a concentrated solution separated from a less concentrated solution by a semi-permeable membrane (a kind of filter through which some things can pass, but others can't), the solutions try to rearrange themselves so they're both at the same concentration. Wait, it's simpler than it sounds! Suppose you have a sealed glass bottle full of very sugary water and you stand it inside a big glass jug full of less sugary water. Nothing will happen. But what if the bottle is actually a special kind of porous plastic through which water (but not sugar) can travel? What happens is that water moves from the outer jug through the plastic (effectively, a semi-permeable membrane) into the bottle until the sugar concentrations are equal. The water moves all by itself under what's called osmotic pressure. 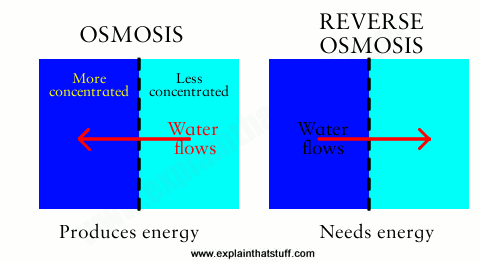 That's osmosis, so what about reverse osmosis? Suppose you take some contaminated water and force it through a membrane to make pure water. Effectively, you're making water go in the opposite direction to which osmosis would normally make it travel (not from a less-concentrated solution to a more-concentrated solution, as in osmosis, but from a more-concentrated solution to a less-concentrated solution). Since you're making the water move against its natural inclination, reverse osmosis involves forcing contaminated water through a membrane under pressure—and that means you need to use energy. In other words, reverse-osmosis filters have to use electrically powered pumps that cost money to run. Like activated charcoal, reverse osmosis is good at removing some pollutants (salt, nitrates, or limescale), but less effective at removing others (bacteria, for example). Another drawback is that reverse osmosis systems produce quite a lot of waste-water—some waste four or five liters of water for every liter of clean water they produce. Artwork: A cutaway of a basic, reverse osmosis membrane filter. Artwork courtesy of US Patent and Trademark Office from US Patent 3,390,773: Water purification system by Ulrich Merten. Gulf General Atomic Inc, July 2, 1968. Ion-exchange filters are particularly good at "softening" water (removing limescale). They're designed to split apart atoms of a contaminating substance to make ions (electrically charged atoms with too many or too few electrons). Then they trap those ions and release, instead, some different, less troublesome ions of their own—in other words, they exchange "bad" ions for "good" ones. Artwork: How ion exchange works: Magnesium and calcium ions (orange and red) flow into the water filter crystals (gray), which initially contain sodium ions (yellow). The magnesium and calcium ions become trapped and the sodium ions are released in their place. One of the simplest ways to purify water is to boil it, but although the heat kills off many different bacteria, it doesn't remove chemicals, limescale, and other contaminants. Distillation goes a step further than ordinary boiling: you boil water to make steam, then capture the steam and condense (cool) it back into water in a separate container. Since water boils at a lower temperature than some of the contaminants it contains (such as toxic heavy metals), these remain behind as the steam separates away and boils off. Unfortunately, though, some contaminants (including volatile organic compounds or VOCs) boil at a lower temperature than water and that means they evaporate with the steam and aren't removed by the distillation process. You can see that different types of filtration remove different pollutants—but there's no single technique that removes all the contaminants from water. That's why many home water-filter systems use two or more of these processes together. If you're looking for a home water filter, tread carefully. Bear in mind that you won't necessarily remove all the nasties. Remember, too, that most water filters require some kind of ongoing cost and, without regular maintenance to keep them working properly, can leave your water in worse shape than it was to begin with! Many people buy water filters or bottled water in an often mistaken belief that tap water is dirty or harmful to drink. In fact, as the Environmental Protection Agency (EPA) reveals, around 92 percent of US community water systems met "all applicable health-based drinking water standards" in 2018 (up from 85 percent in 2005). In England and Wales, for the year 2017, the Drinking Water Inspectorate reported that 99.96 percent of drinking water met national and European standards (involving some 40 different quality measurements). Those figures are pretty remarkable really, when you consider just how dirty we make water and some of the things (like pesticides and car oil) that people flush down their drains. Even so, the high quality of most drinking water doesn't stop people spending something like $280 billion, worldwide, each year, buying bottled water that's several thousand times more expensive than tap water. Why not break the habit of buying bottled water? You can reuse certain types of disposable plastic bottles, providing you wash them out thoroughly and air dry them, but it's safer to buy yourself a hygienic reusable plastic or aluminum water bottle and fill that from the tap instead. Do that as few as 10–20 times and your bottle will soon pay for itself. Best of all, give the money you save on bottled water to WaterAid and help some of the people who genuinely lack clean water in developing countries. Let's count ourselves lucky we don't have to drink water straight from a dirty river, like many people still do. As an interesting aside, remember that we spend $280 billion a year on bottled water? Let's put that in context. One of the UN's Millennium Development Goals was to "halve by 2015 the proportion of people without sustainable access to safe drinking water and basic sanitation"; in 2012, the World Bank estimated that the annual cost of achieving that would be $184 billion. London Mayor Seeks Revival of Public Drinking Fountains by Alan Cowell, Guardian, 4 December 2017. Providing more public water points is one way to solve the bottled water problem. Should I stop drinking bottled water? by Luisa Dillner, The Guardian, 1 June 2015. Why tap water may be better for you than bottled. Selling Bottled Water That's Better for the Planet by Gloria Dawson. The New York Times, April 30, 2016. The story of Just Water, which aims to provide a better alternative to bottled water. The Story of Bottled Water: The Guardian, 14 December 2010. A couple of great videos here that explain the real cost of bottled water. Bottled water: who needs it? by Tom Heap, BBC Panorama, 18 February 2008. Examines the case against bottled water asking questions such as this: is it morally acceptable to import bottled water from Fiji where one third of the population lack clean, safe drinking water? US EPA: Ground Water and Drinking Water: Definitive information about drinking water quality and safety from the Environmental Protection Agency. UK Drinking Water Inspectorate: Drinking water quality and standards from the UK government. [PDF] EPA: Water Health Series: Filtration Facts: This eight-page, independent guide to water filtration discusses whether you really need to filter your water and compares the effectiveness (and cost-effectiveness) of the different methods. Ask Well: Should You Filter Your Water? by Roni Caryn Rabin. The New York Times, December 31, 2015. Your tap water might pass the legal limits, but are those limits stringent enough? Installing a reverse-osmosis water filter by Merle Henkenius, Popular Mechanics, January 2004. Another easy-to-follow how-to for DIY enthusiasts. 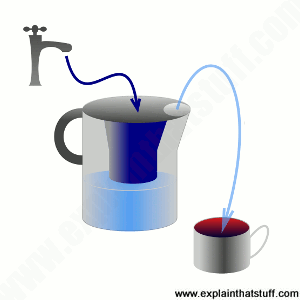 For more details about how water filters are constructed in practice, try these references. I've picked one typical example of each of the main types of filter; you can find many more examples by searching Google Patents or the USPTO website. US Patent 3,390,773: Water purification system by Ulrich Merten. Gulf General Atomic Inc, July 2, 1968. Describes a typical reverse-osmosis filter system. US Patent US,7537,695 B2: Water filter incorporating activated carbon particles with surface-grown carbon nanofilaments by Michael Donovan Mitchell et al, Pur Water Purification Products, Inc., May 26, 2009. A state-of-the-art activated-carbon and carbon nanofilament water filter. US Patent 4,474,620: Apparatus for purification of water by ion exchange by James W. Hall. October 2, 1984. A typical ion-exchange filter using gravity and a manometer pressure effect. US 20040003990 A1: Water purification apparatus and method for purifying water by Pierre Mansur, January 8, 2004. A recent patent for producing "pure" distilled water from tap water using both distillation and carbon filtration.